Happy Tuesday Everyone!! Thanks to everyone who came by on the Jaded Blossom blog hop! Now who wants to know the winner of these notecards? Congrats Callyann! Please email me at candacepelfrey@yahoo.com with your address and I will get them mailed out to you. 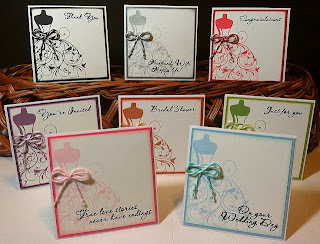 Now on to a birthday card that I created using the new Make a Wish stamp set from Jaded Blossom. I also used the Jaded Blossom flag die on this card. The cute little bird is cut from Treasure Box Designs. toooo cute chickie !!!! love the bird ! congrats to the lucky winner!! your card is super cute! love the polka dots on the birdie and the background. Congrats to the winner and love your wedding cards and the cute little birthday card! Congrats to the winner! Those cards are gorgeous! And look at this adorable little chickie! Love it!! I love the birthday card. Thanks for sharing your great work! !